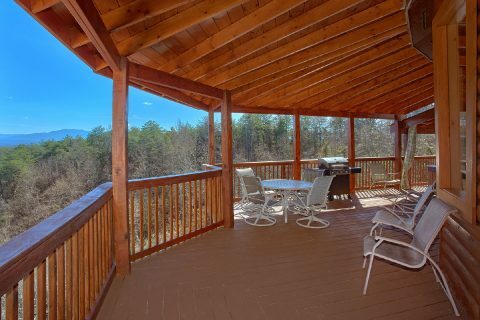 Searching for a cabin that's right for your Smoky Mountain vacation? 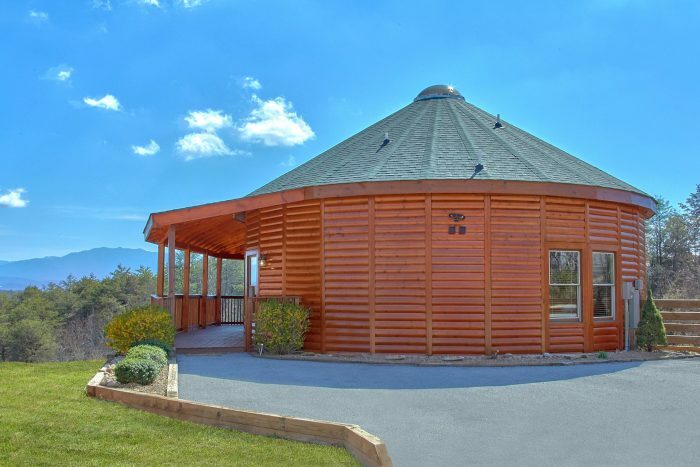 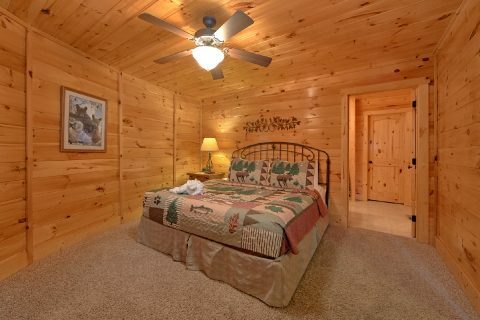 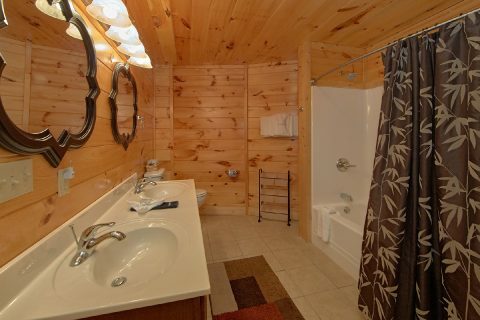 Consider "Star Gazer," a beautiful log cabin in the Grand View Resort area of the Smokies! 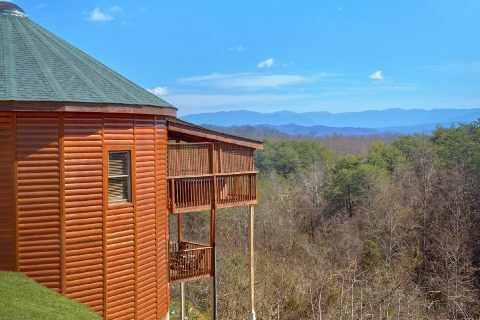 This log cabin resort boasts a great location only 5 miles from Pigeon Forge and it also offers resort pool access. 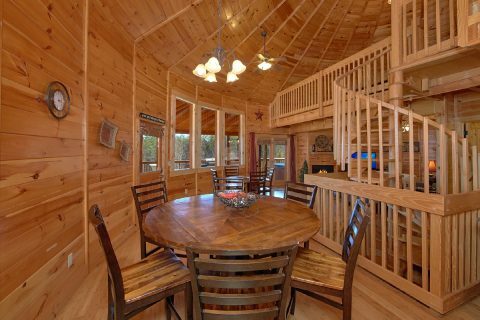 This unique cabin boasts a rounded design and a wrap-around deck that provides excellent mountain views. 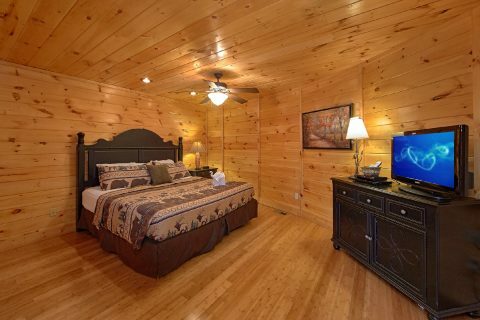 This spacious cabin rental offers 3 king-size bedrooms with private baths and it can accommodate up to 10 guests in comfort, so "Star Gazer" is just the right size for a family vacation or a fun gathering of friends. 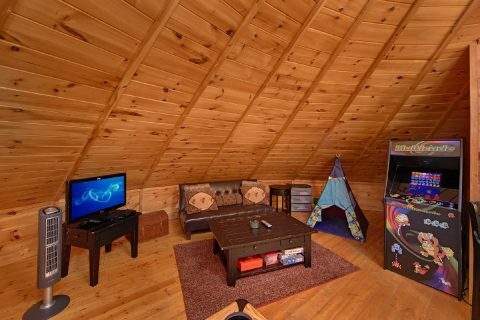 With a sleeper sofa in the living room, a futon in the game room loft, and a Pack n Play child's bed, there's plenty of extra sleeping space for guests. 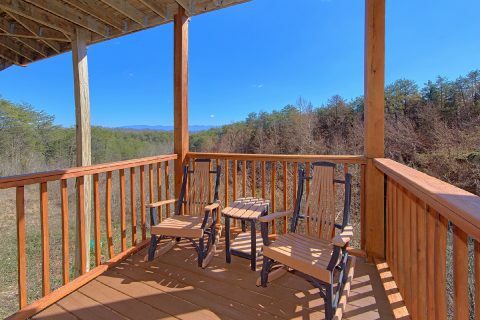 When you wake from a great night's rest in your Smoky Mountain cabin rental, you can step outside onto your cabin's deck to enjoy the lovely mountain scenery. 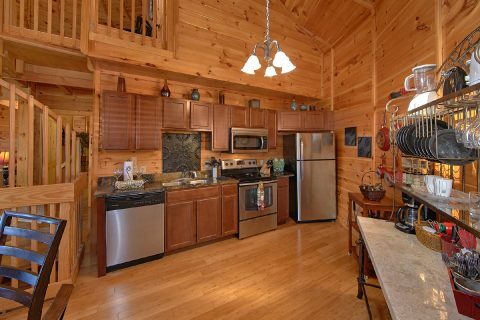 Next, cook a hardy breakfast in your cabin's full kitchen or make a quick trip to Downtown Pigeon Forge to try a fantastic local pancake restaurant. 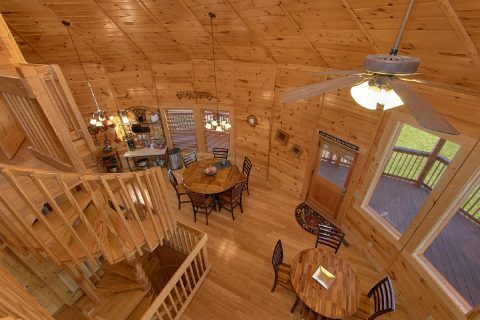 After breakfast, you can plan out your day's adventures with the help of this cabin's WiFi Internet Access. 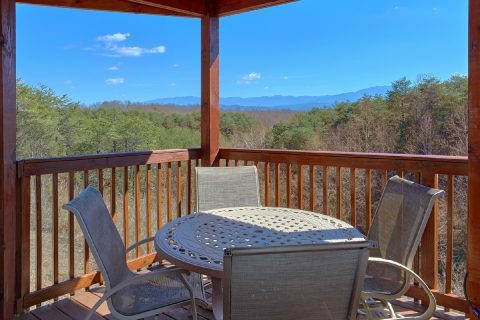 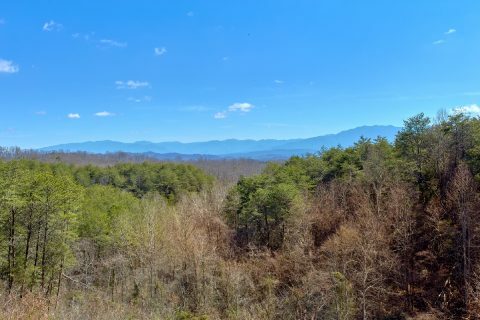 Whether you decide to go to Dollywood Theme Park, check out shopping in Downtown Pigeon Forge, or go hiking near Gatlinburg in the Great Smoky Mountains National Park, this rental keeps you close to all the action. 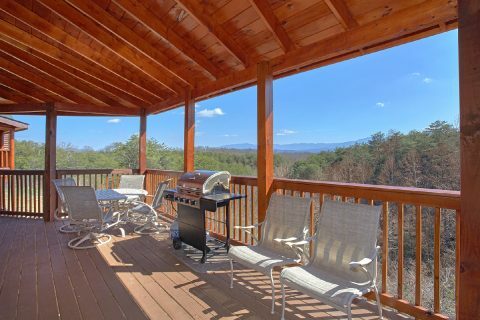 Looking for a vacation with lots of rest and relaxation? 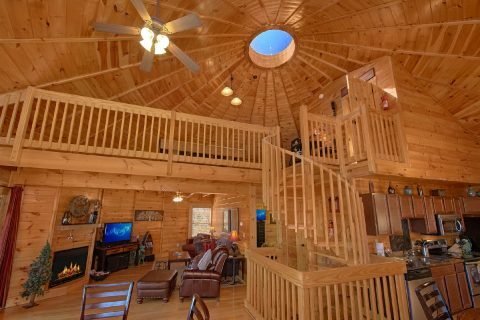 "Star Gazer" is a cabin that ensures you won't have to go far to enjoy a relaxing get away. 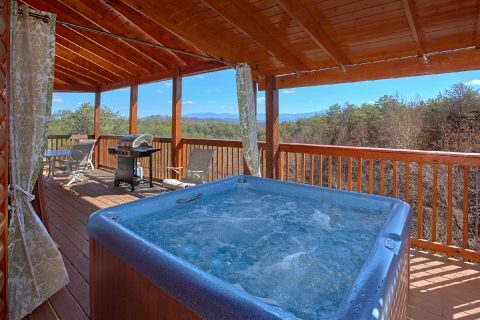 During the warm summer months, you can relax by the resort swimming pool. 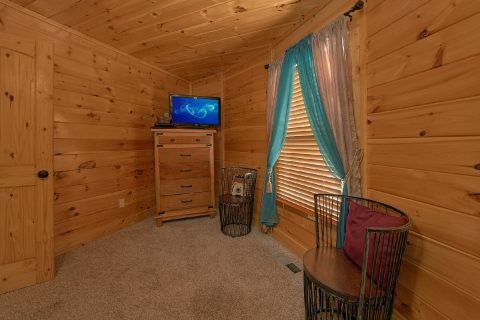 In the winter, watch a movie curled up by the electric fireplace in the living room. 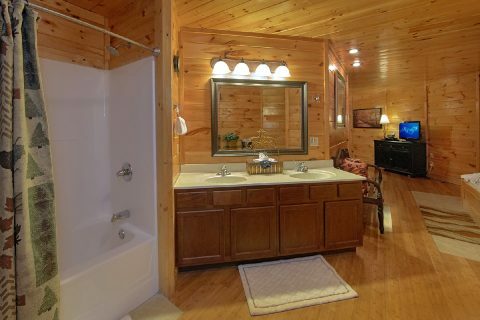 No matter the season, you can enjoy a relaxing soak in your cabin's outdoor hot tub. 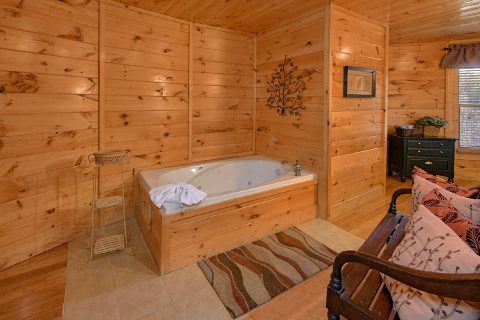 For a soothing bath in privacy, you can always take a dip in the jetted jacuzzi tub. 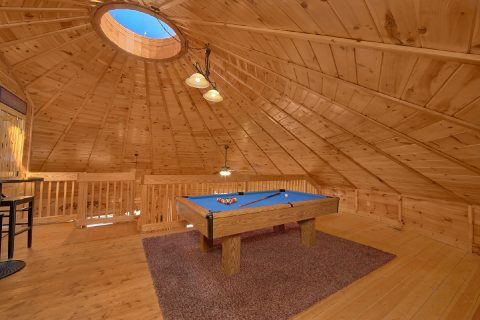 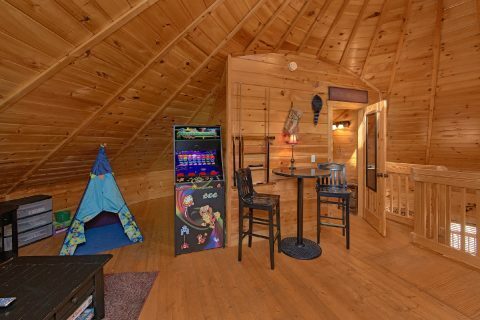 This 3 bedroom log cabin also comes complete with a game room loft with a pool table and an arcade game. 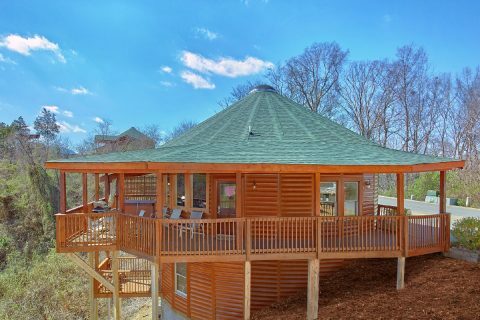 This affordable cabin also gives guests access to discount tickets for Wahoo Zipline and Wahoo Glass Bottomed Boat Ride! 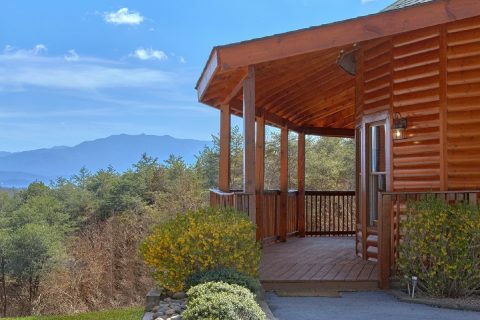 Book your own log cabin with a mountain view by reserving "Star Gazer" today with Cabins USA Gatlinburg! 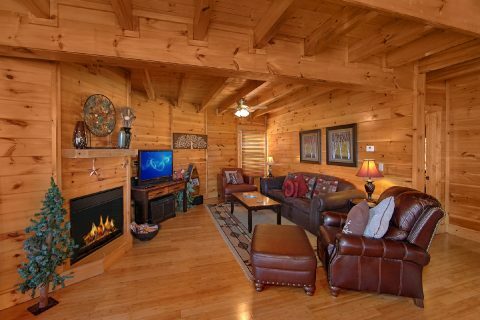 Enjoy a Smoky Mountain vacation for less with this cabin's special 15% discount!